Save gas; don't make left-hand turns. Home » Frugal Living » Save gas; don't make left-hand turns. You have to hand it to UPS. They crunched the numbers, they looked at the hard facts and they figured out that by limiting the number of left-hand turns made, you can save a whole bunch of money on gas. Joel Lovell of the NY Times revealed on Sunday that the UPS has significantly cut down its gas usage by carefully calculating routes to avoid left-hand turns. Not every left turn of course, that would be ridiculous. But by employing a program called "package flow" the fleet of over 95,000 trucks can now avoid a massive number of left-hand turns, taking only the ones necessary to complete the trip. As you're no doubt aware, left-hand turns are far more costly because of the waiting time involved. There's rarely a "left on red" rule and thus drivers have to idle, wait for the lights to change and burn up gas. Depending on the cross street, that can take up considerable time and fuel. The "package flow" program has put an end to most of that, and has also saved time and mileage in the process. As always, the proof of the pudding is in the eating. And these results are very tasty. Last year UPS shaved over 28.5 million miles off its delivery routes. That in turn has resulted in saving roughly three million gallons of gas! It's also reduced CO2 emissions by 31,000 metric tons. This is an example of lateral thinking at its best. It saves time, money and the environment, and everyone is a winner. Those of you with those handy GPS navigation devices may want to think about doing something similar on your drive to work. If you can cut out the left-hand turns without eating up any extra miles or time, you could see a nice drop in your fuel bill. With the cost of gasoline still over $3 a gallon, that could add up to quote a nice pile of extra cash every year. Now, I'm off to send my holiday packages via UPS. I don't understand why so many people are praising UPS over this; it's not like they were the first to think of it. I am a newspaper delivery driver (independent, I use my own vehicle and pay for my own gas). 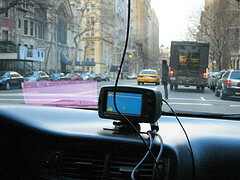 As the price of gas soars you always look for the quickest and easiest way to get done. Ask any delivery driver about the idea of reducing left turns and most will tell you they have been doing this for years. I think it's probably because UPS, as an entire huge company, embraced the concept and implemented it. That's not something you see all the time. The bigger the company, the harder it is to make positive changes! Most companies are like enormous cruise liners. It takes long enough to stop going in one direction, let alone turn around. I think we all have to applaud UPS. Imagine if every company was as forward thinking. Driving a standard can help alot, if I'm stuck in traffic (carefull about coasting as the brakes stop working) or waiting at light. Only thing is you have to watch for the change so you don't get caught off guard, Costing can help, every bit helps get that extra bit out. 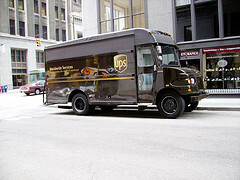 I'm looking forward to some UPS hybrid delivery trucks next! As I recall reading in some article about the time UPS started implementing this policy, their primary focus was to reduce delivery times. However I'm sure they're more than satisfied with the added fuel savings benefit! Coasting only reduces 'engine braking'. The operation of your actual brakes will still work fine! So... Let's say your home is north and west of your office, meaning you have to go south and east to get to work. If you're headed south on Main Drag One and you need to turn east (left) onto Main Drag Two, you'd be better off to go one block further south, then turn west, north, and east (right, right, right, stopping at intersections & waiting for the traffic to clear for each turn) instead of making one left turn? Does that really add up? It sure is counterintuitive. Or am I missing something here? No, in that case you would, after leaving your home, drive east first, and then make a single right turn to drive south - rather than driving south first and making a single left turn to drive east. In either case you still end up south and east of your home. Of course, this changes which roads you would drive on and thus its effectiveness is contingent on there being similar speed roads available (and no geographic barriers like bodies of water..) but in large grid-layout cities, this isn't usually an issue. If the big three were not OPEC controlled, and if Exxon et. al., were not OPEC controlled, if the boards of these and other "American" companies were free to do so without offending major shareholders like the Saudis . . . America could produce and use fast light Euro-style diesels instead of gas engines. Euro-diesels are up to 40% more efficient than gas engines and DO NOT require additives or cracking to burn fuel, two major areas of savings for American customers and a FORTY PERCENT REDUCTION in fuel costs across the board. Modern well tuned diesels with scrubbers do not stink and are safer and longer lasting than gasoline engines - a fact! Instead, we stick our heads up our nether-parts and pray for an "Obama Miracle" a miracle where we don't have to change, and everything will be alright! It Ain't gonna happen that way America! The humongous social and economical paradigm shifts driven by the (GRD) great republican depression are just starting to be felt by the unemployed or otherwise disenfranchised in America! Before the GRD is done with us, even the "American Dream" will have undergone changes we can't even imagine now! All of this is in the face of China's unending, self-regenerating, 55 cent and hour, 14 hour a day, 7 day a week army of female workers, trained already by GM to build Buick Lesabre's and ready to fill the docks at Shanghai with Eco-Box cars to be sold on the American market for $6000.00 a copy at a Walmart near you! UPS'es effort is applauded, but too little, too late, to say the least! The no-left turn policy works for UPS because it's a company built on delivery (and, therefore, driving). Any individual UPS driver, on a daily basis, drives many more miles in both suburbs and cities than most of us would ever have to drive. This entails, by definition, potentially a LOT more left turns that one UPS driver would make (or skip) in a day than the typical commuter. Also, UPS drivers, because they park (or sit still) often during the day in between stops, use more gas than the typical driver. Then, multiply this effect by ALL the drivers driving for UPS in the course of one day, and of course UPS' gas savings would be tremendous by implementing a no-left-turn policy. The rest of us, because our daily driving habits are quite different from a UPS driver's, probably wouldn't save much gas in trying to follow a personal no-left-turn policy (and might garner a lot more frustration, as well).